« Lass by Harloe Rae Blog Tour with Excerpt and Giveaway! 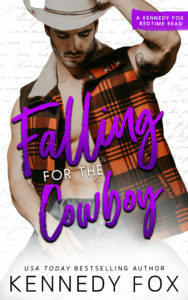 FALLING FOR THE COWBOY, the third steamy, standalone romantic comedy in the Bedtime Stories series from USA Today Bestselling Author, Kennedy Fox, is available now! Sign up for their newsletter to stay up-to-date with Kennedy Fox!